Nowadays some kind of metal is used in almost everything we use in our daily life. From the circuits on our smartphone to the metal beams that support homes and buildings metal has become an essential material for us. As you may know, durability and conductivity are critical elements of metal, which makes it perfect for many jobs. But for it to work as it should, it must have a specific shape. There’s come the necessity of plasma cutter and how does a plasma cutter work? To get metal to the desired shape, you need a precise and powerful tool. In most cases, this tool is a plasma cutter. Plasma cutters have become one of the most reliable tools in most industries, and today we will explain everything that goes on with this unique tool! Well, in simple terms it is a tool that allows you too easily cut through most metals. They are used in many factories and constructions around the world because they can cut through metal in a precise and reliable way, giving you the exact cut every time you power it up. They come in a wide variety of sizes and shapes, so almost anyone can get their hands on a plasma cutter. You can find smaller and less powerful versions of these in your local hardware store. Apparently, the bigger the cutter, the better, but we will dive deeper into this later on in the article. Plasma cutters where created almost 50 years ago and since then they have just increased in popularity and reliability. Back in the day, only particular manufacturers had these in their factories, mainly because it was a bit more expensive than using a blowtorch. Plus, since it was not that popular, most people did not fully trust the plasma cutter. Mostly because there were not many professionals that knew how to hand these tools properly. There are specific precautions that you need to take when handling a cutter, so not having someone with experience could be a significant risk. Plasma cutters are useful but complicated. The name can be kind of intimidating since we are not so familiar with the usage of the word “plasma” in our daily life. But by the time you are finished reading this, you will know what the word “plasma” really means. If you raise the temperature of a solid to its boiling point, it becomes a liquid. If you add more energy, it becomes gas, and once you add enough energy, you get a plasma. Depending on the gas, you may require a more significant amount of energy to turn it into plasma. In simpler terms, a plasma cutter adds enough energy to a gas (usually nitrogen or argon) until it becomes plasma. But this is an oversimplification since there is a detailed and more complete process behind this. 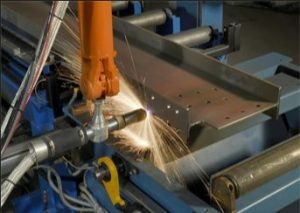 Plasma cutters send a constant stream of gas through a channel which is in the center of the cutter. Close to the end of this channel, there is a negatively charged electrode which when given enough energy, it will start a small but powerful spark that will begin heating the gas. The constant stream of gas becomes plasma once it reaches the correct temperature, which is close to 30,000° F. From here, you will get a continuous flow of plasma which will slowly melt metal to a point where it cuts cleanly through it. The bigger the gas stream, the more time it will take to heat up and the more energy you would need to use. But it also will give you a cleaner cut, which in some cases is a must. In manufacturing, the nozzle is guided by a robotic arm. In most cases, these robotic arms are guided by a blueprint, which determines what pattern will the arm follow. This is used a lot when you need to keep a regular pattern, if you are going to make specific cuts, you could also do it by hand. Manual plasma cutting by hand requires you to take some safety measures, but this may be the most reliable way to do it if you need a single specific cut to be made. As you can imagine, if the plasma cutter is good enough to melt metal, it could cut through almost everything. Plus, the energy that is added to the gas stream is so high, that if you lose control of it, you may be in serious problems. We have written a guide on how can you avoid such plasma cutter problems. Because of this, all plasma cutters come with regulators and safety measures. For example, they come with a unique set of channels that expel shielding gas around the metal that is cut. This is done to control the stream of the gas and to control the diameter of the beam. 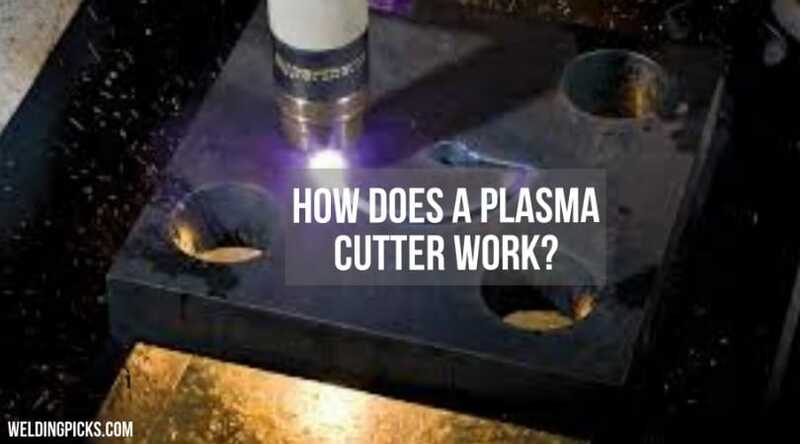 Although it may seem easy enough to understand how a plasma cutter works, you need to have a history with plasma cutters if you are planning to use this for a specific project. Do you still have questions about how to use a plasma cutter? Check out this article.